Finding an old game sitting in a video game shop in mint condition for over 25 years is extremely rare. That rare moment came last month when someone–a man, a woman, or however they self-identify–bought a brand new copy of Sonic the Hedgehog 2 for the SEGA Game Gear. They didn’t buy it off of eBay, Amazon, or from a consignment shop somewhere in South Florida. (Estoy mirando a ti, Valsan.) They bought Sonic 2, new, mint condition, at a store that’s been carrying the prized sequel since it came out one sweet November day in 1992. This odd transaction was discovered Saturday by Mat Piscatella, a video game industry analyst at The NPD Group, a market research company in Port Washington, NY. 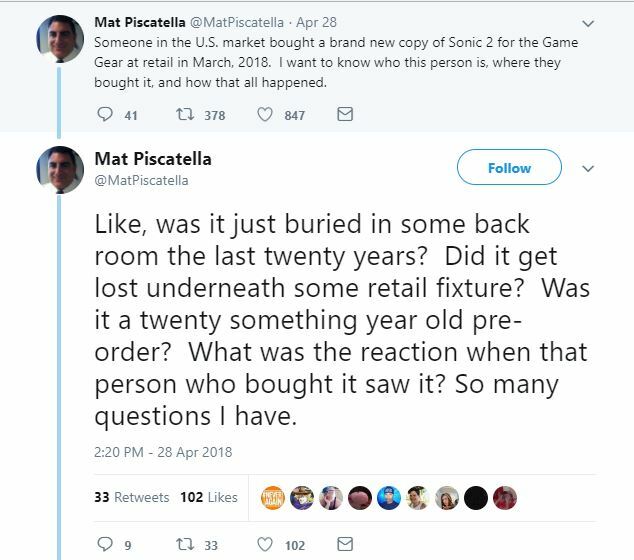 Piscatella explained that The NPD Group receives point-of-sale (POS) data from different retailers, such as Best Buy and GameStop for example, and he was surprised to see Sonic 2 show up on the sales charts. The first three questions sound plausible. Since Piscatella’s employer collects sales data from notable retailers, the only theory about the transaction that stands out is that someone found it in a Toy R Us. Everyone’s favorite toy store since 1947 is closing all U.S. stores and liquidation is ongoing. When the signs scream “EVERYTHING MUST GO!” they mean everything, including items that are not as hot as they were when they hit the market many Christmases ago. As of now, Piscatella has found no relevant information regarding the purchase of the minty Sonic 2 cartridge. Consider this a case gone cold.